Joyce Chen Good Earth Stoneware Tea Cup Set - I'm desperate! 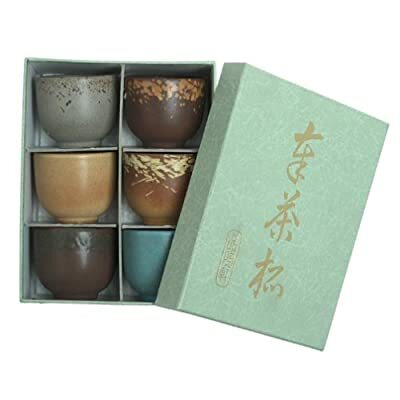 I recently stumbled across the old Amazon listing for the Joyce Chen Stoneware Tea Cup Set, and it is sooooo gorgeous. I'm in love with it but it's no longer available...anywhere! Not on Ebay or anywhere online. I think these cups are so stunning, I'd do anything to find a boxed set of them. If anyone knows where to find them or would be willing to sell yours, or have any ideas, please let me know. I'm seriously smitten! Thank you for looking, here's a pic of them. Re: Joyce Chen Good Earth Stoneware Tea Cup Set - I'm desperate! Try the online aution sites like EBay. I did email Joyce Chen headquarters and they said that it was out of stock for good. Someone linked to some similar ones. Those are pretty but they don't have the earthy "matte" appearance of the Joyce Chen ones. Thanks though. I will keep checking Ebay. I just can't believe that they are so hard to find. Usually one can find anything on the internet if they look hard enough but this teacup set seems impossible to find. If anyone has a complete set that they want to sell, I will pay 200% of the original price. you might consider having a potter make you a set, etsy or one of the people who post here. TomVerlain wrote: you might consider having a potter make you a set, etsy or one of the people who post here. +1 ... one of our member TeawareArtisans right here could easily do something earthy like these ... and they would be handmade by an artisan versus factory made. Good luck in your search. I understand being on the hunt for a particular thing, but in case you don't find them soon, check out Rikyu Tea Market. Many teacup sets from Japan, and most are not mass produced like the Joyce Chen stuff. I've ordered from them before and their customer service is incredible. Send a little money Japan's way, I'm sure they can use it right now. iris_bulb wrote: I recently stumbled across the old Amazon listing for the Joyce Chen Stoneware Tea Cup Set, and it is sooooo gorgeous. I'm in love with it but it's no longer available...anywhere! Not on Ebay or anywhere online. Hi, I know this is an old forum post but... if you're still looking for this teacup set, I have it. I have never used them for anything other than display. I am looking to sell them. I will be the set on Facebook marketplace tonight.